Enjoy this fun introduction to the Spanish gastronomic culture. 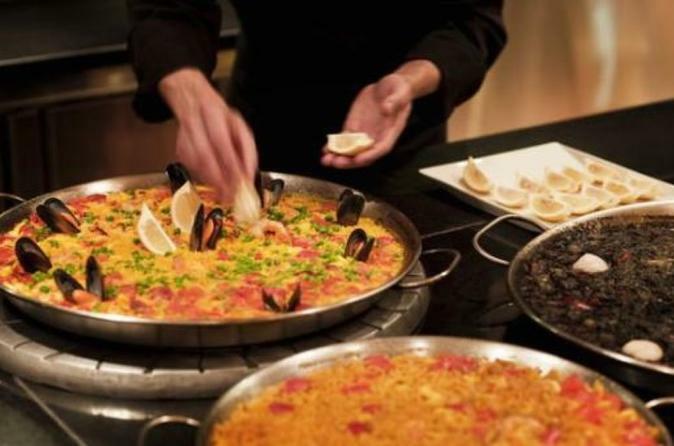 You will learn how to cook Paella,Tortilla, Sangria, and more Spanish food. After taking this class you will be ready to prepare these most famous Spanish recipes at home. Spanish cuisine is known worldwide as one of the most varied, healthy and tasty cuisines. For centuries it has incorporated seafood and ocean fish (best caught daily), cheeses, hams, olive oil from Andalucia, and fresh vegetables from the garden of Mediterranean east. All accompanied by fantastic varied wines, Red, White, Rosé, Jerez, Manzanilla, Cava (Spanish Champagne), Sherry and Txakoli. Your cooking experience will begin at a designated meeting point. Learn how to cook Spanish dishes that have traveled the world. You will cook them yourself with the aid of an experienced chef, in a small group. At the beginning you will visit fresh food stalls, where the chefs will give you plenty of tips on picking local, seasonal products. Then you can start cooking dishes like paella, Spanish omelet (tortilla), Andalusian salad, and sangria, all while enjoying and learning about Spanish cuisine. After you have prepared your dishes, you can taste them, while trying different Spanish wines.